Shred chicken, dice onions, chop tomatoes, & puree baby food with the The Cuisinart Elite Food Processor 2.0-the new standard for the next generation of home food prep! The feature-rich Cuisinart FP-14DCN ships with several accessories & attachments, including a 4.5-cup mini work bowl, an adjustable slicing disc, and a reversible shredding disc. Having two sizes of work bowls makes the Cuisinart Elite FP-14DCN like having two food processors in one. The Cuisinart Elite Food Processor's included 4.5-cup mini bowl can be used to chop, mince, or dice smaller batches of produce while the 14-cup bowl can be used to make large portions of dip, salsa, and soup. The Cuisinart Elite Food Processor's included blades let you choose between 6 different slicing thicknesses & 2 different shredding consistencies. Blades are made from durable stainless-steel and use Cuisinart's SealTight Advantage SystemT to seal the bowl. The Cuisinart Elite's 1300W motor (peak power) is perfect for kneading thick bread dough to pureeing vegetables. Step up to a new standard in food prep with the Cuisinart Elite Food Processor 2.0! Cuisinart Elite Food Processor 2.0 (14 Cups, Die Cast) Features. Large food processor for high-demand home kitchens from Cuisinart. Like having 2 food processors in 1. SealTight Advantage SystemT seals bowls and locks blades. Easy on/off locking system with push-button release. 14-cup large bowl + 4.5-cup small bowl w/pour spouts & measurement markings. Stainless-steel adjustable slicing disc (1 to 6mm) w/ finger grips. Stainless-steel reversible shredding disc (fine/medium) w/ finger grips. Large & small stainless-steel chopping/mixing blades w/Blade Lock system. Cuisinart Supreme Wide-Mouth Feedtube & Cover Assembly. All removable parts are dishwasher safe. 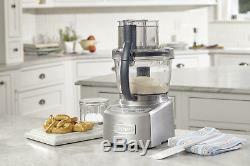 Cuisinart Elite Food Processor 2.0 dimensions: 11.75" x 11.25" x 17. The item "Cuisinart Elite Food Processor 2.0 (14 Cup) Die Cast" is in sale since Tuesday, July 31, 2018. This item is in the category "Home & Garden\Kitchen, Dining & Bar\Small Kitchen Appliances\Food Processors".